Published Apr 15, 2018 by Addison-Wesley Professional. Part of the LiveLessons series. 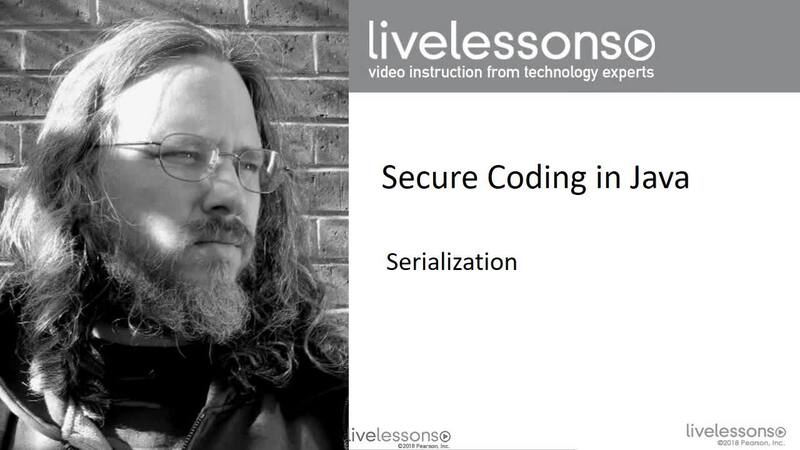 Secure Coding Rules for Java: Serialization LiveLessons provides developers with practical guidance for securely implementing Java Serialization. Secure coding expert, Robert C. Seacord trains developers to understand Java serialization and the inherent security risks. Seacord also demonstrates how to securely implement serializable classes and evaluate mitigation strategies and alternative solutions. Java deserialization is an insecure language features that is widely used both directly by applications and indirectly by Java modules and libraries. Deserialization of untrusted streams can result in remote code execution (RCE), denial-of service (DoS), and a range of other exploits. Applications can be vulnerable to these attacks even when they are free from coding defects. Robert C. Seacord is a Technical Director with NCC Group where he works with software developers and software development organizations to eliminate vulnerabilities resulting from coding errors before they are deployed. Previously, Robert led the secure coding initiative in the CERT Division of Carnegie Mellon University’s Software Engineering Institute (SEI). Robert is also an adjunct professor in the School of Computer Science and the Information Networking Institute at Carnegie Mellon University. Robert is the author of six books, including The CERT C Coding Standard, Second Edition (Addison-Wesley, 2014), Secure Coding in C and C++, Second Edition (Addison-Wesley, 2013), The CERT Oracle Secure Coding Standard for Java (Addison-Wesley, 2012), and Java Coding Guidelines: 75 Recommendations for Reliable and Secure Programs (Addison-Wesley, 2014). Robert is on the Advisory Board for the Linux Foundation and an expert on the ISO/IEC JTC1/SC22/WG14 international standardization working group for the C programming language.